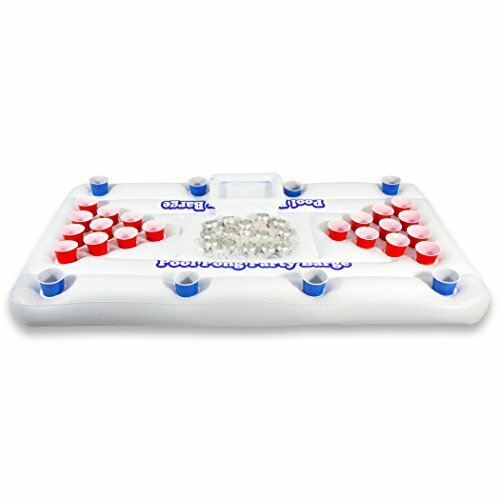 The Pool Pong Party Barge is the first and only floating beer pong table to include a built-in cooler so ice-cold drinks are always within reach. The 6ft x 3ft table includes 10 cup triangles on each end for full size pool pong play. Each side of the raft is also lined with 4 cup holders for social floating, so you and friends can float and socialize around the table between pong games. The central cooler can hold up to 18 cans with ice. The Party Barge can also be used as a floating tanning lounge if you're ever able to get it all to yourself. The Party Barge includes 6 pong balls (cups not included) and is retail packaged. GOPONG WARRANTY: Beware of cheap knockoffs that look similar in pictures. GoPong stands behind all of its products 100%. We always replace damaged or defective items for free so you can buy with confidence. If you have any questions about this product by GoPong, contact us by completing and submitting the form below. If you are looking for a specif part number, please include it with your message.